Friday 13th November: Masterclass at Salford University. When i’m not gigging i’ll be finishing CD number 5, which I intend to release early in the New Year on Vinyl, CD and download. 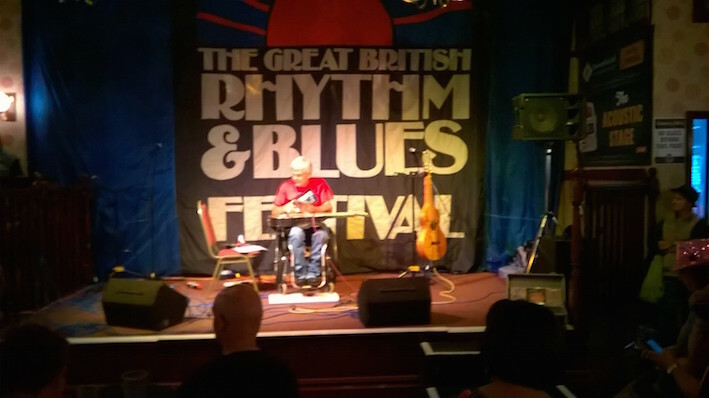 We arrived at Colne 20 minutes early last night for my set on the Acoustic Stage. I think its about 10 consecutive years that i’ve been there. Its become one of my favourite gigs and I have a loyal following alongside a new audience each time. Rather than go indoors, we shared a plastic table with a plastic beer with two blokes, Baz and Marcus who had been at the Festival all weekend. Within minutes Marcus had us laughing with his fantastic quick witted stories and self effacing humour. They both came in to watch my set, so I played the first song, “I went back for Georgia” for Marcus. Unbeknown to me Marcus, wrote me a long note on the back of his bank receipt. It was heartfelt, warm and personal, so I don’t feel its appropriate to put it in here without his permission. At the end of my set a chap came onto the stage and asked me to sign his book. He’d done a stunning pencil drawing of my face as I’d been playing. Playing live just doesn’t get better than an interactive, appreciative and quiet room. Helps me to play at my best. 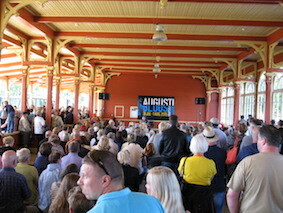 On 1st August, I played in Estonia at their annual AugustiBluus Festival held in the town of Haapsalu. The Estonians love their music, its an integral part of their history. During the recent Soviet Occupation, President Gorbachev’s perestroika saw the Estonians use (amongst other things); their National anthem to help regain their independance I love the idea of singing your way to freedom – if only it were so simple. 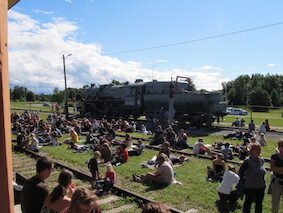 As with any struggle to assert independence, thousands suffered prior to Estonian independence in 1991. Let’s just say the Estonians are a strong and proud race and music has significant meaning and power there. 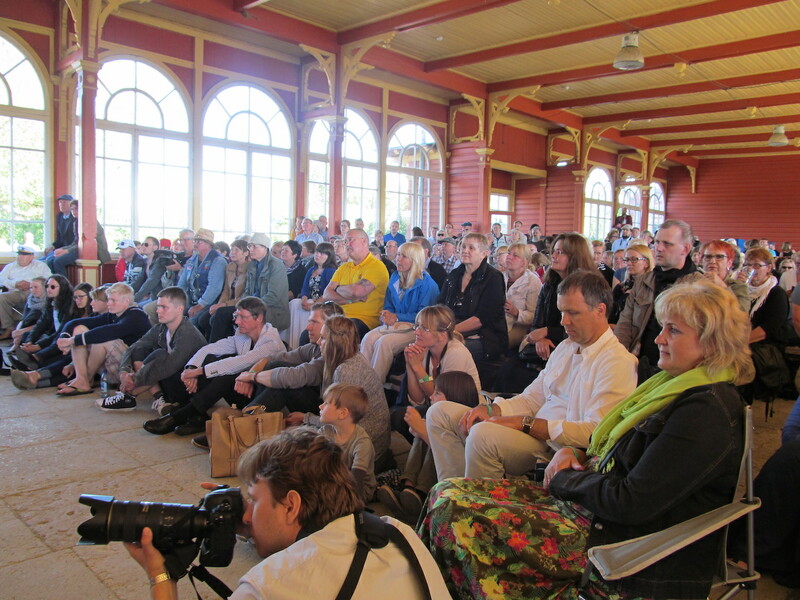 Just look at the mixed ages in these photos of my set at the old railway station. It was brill to play there and I hope to go again some day. I was here during May bank holiday for this annual festival in the village of Botton in the North Yorkshire Moors. 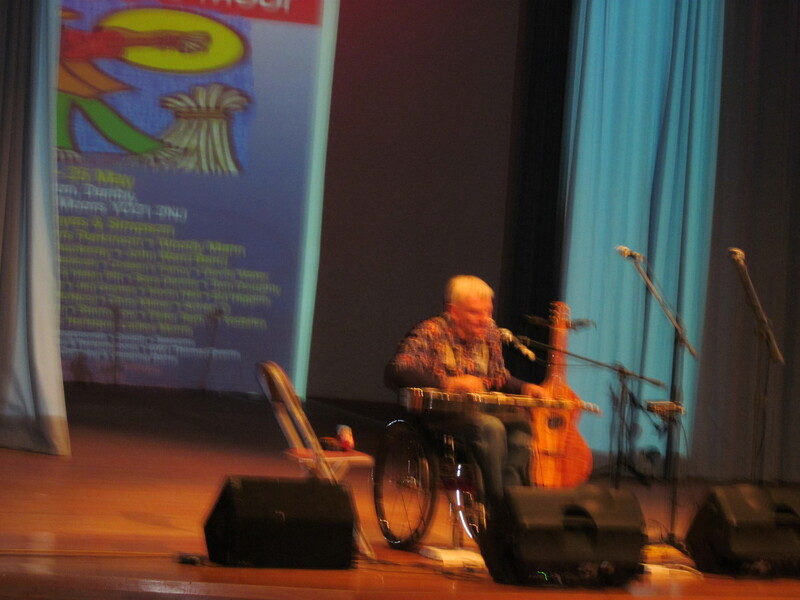 Martin Carthy was particularly interested in the lap slide guitar. I can so remember his album ‘Marin Carthy’ where the sleeve photograph was of him playing a guitar suspended from a crane on a pallet somewhere over London. 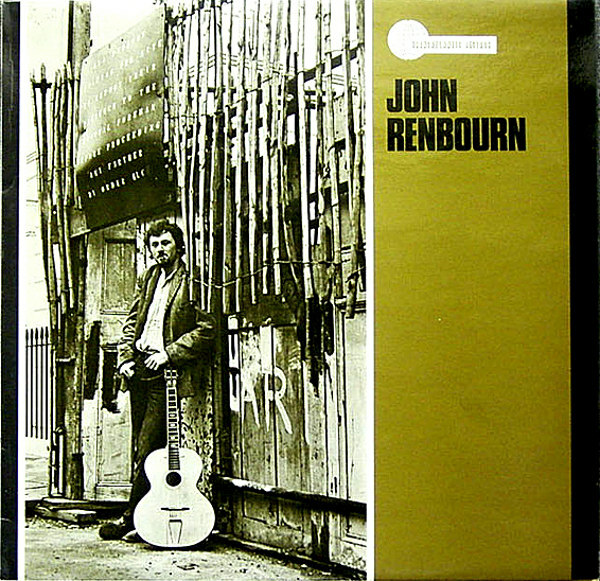 John Renbourn had a similar thing going on with his album ‘John Renbourn’; music for the working man I wonder? 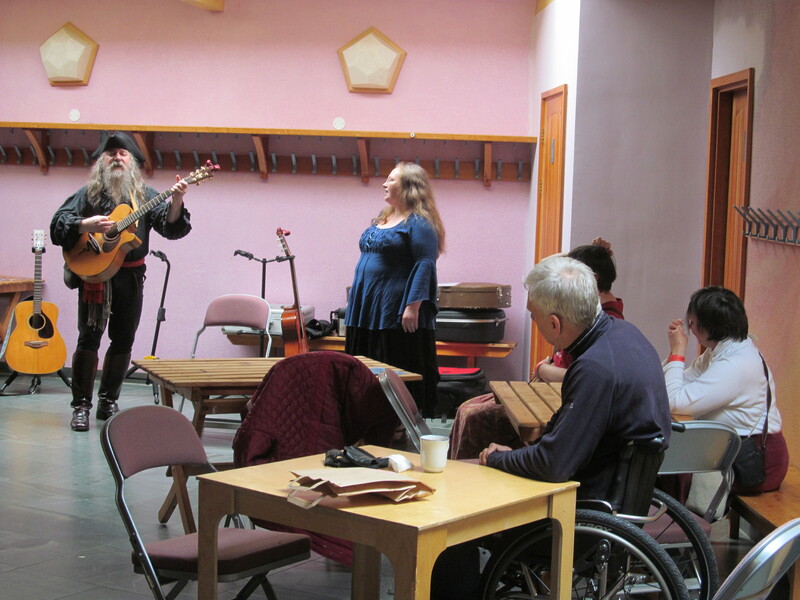 I last saw John Renbourn during the weekend of 20-22nd March at a guitar playing weekend. He and Wizz Jones were our invited guests and over the years John had become a good friend and sage. He enriched my life in many ways. As a youngster , I would lift and drop the needle of the LPs to try and learn songs like ‘Another Monday’ or Lady Nothing’ or ‘I know my Babe’. Later we shared several stages, the first one being in Columbia University in New York in 2000. The photo below is from the same gathering in New York, 2001. 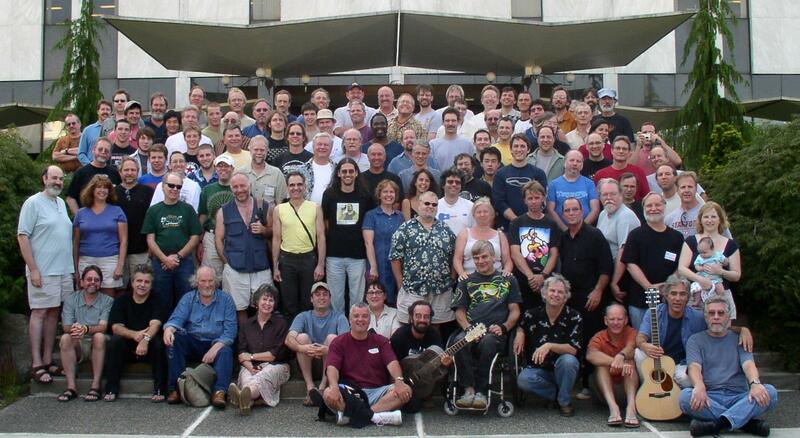 John is on the front row, third from the left. He died at home just a few days after that weekend but has left a massive legacy of music and memories. Weissengnome is on twitter. 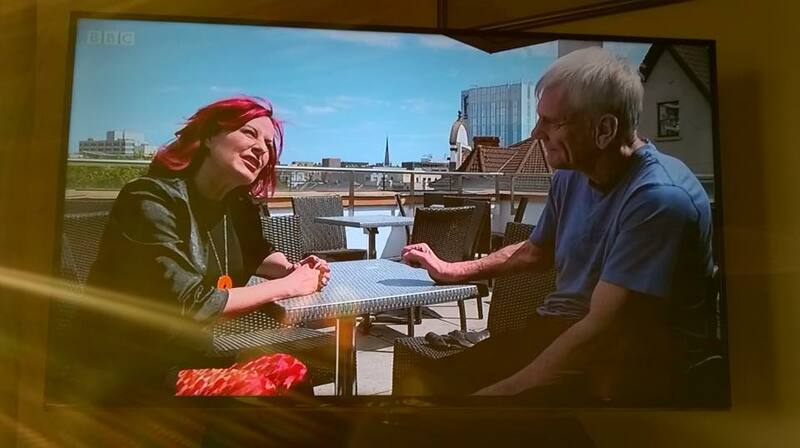 Don’t bother, just keep doing face to face communication, come to live gigs and turn your phones and cameras off.